Astronomy Adventures stargazing tours in Santa Fe, New Mexico - Join us! Do you remember a time when the skies were darker, the stars brighter and the wonder and awe of the night sky was enough to captivate the imagination? Astronomy Adventures does. In 2019, we begin our 18th year of discovery. Astronomy Adventures offers educational and entertaining guided night sky tours. The tours are a great way to experience the grandeur of an unspoiled night sky filled with thousands of bright, twinkling stars. 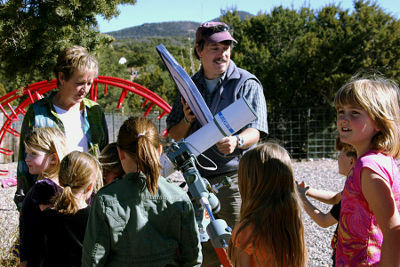 No visit to Santa Fe should be considered complete without a stargazing evening at Astronomy Adventures. I invite you to join me for an experience that goes far beyond the ordinary. Here in New Mexico, we still have skies that are clear and dark enough to explore the many fascinating jewels of the night. Our safe and secure dark site is an easy drive from Santa Fe. Come on out and get acquainted with some of nature’s most distant and beautiful creations. Browse the navigation bar to learn more about Astronomy Adventures. The ‘Check Dates & Book’ tab provides a convenient way for you to plan and reserve your Astronomy Adventure without delay. If you have questions, call me at 505-577-7141. I look forward to sharing the beauty and majesty of the New Mexico night sky with you. Thanks for stopping by and Clear Skies!